This is a long overdue report for a trip to California in October of 2006. This was another photography trip in support of my other site Western Mining History. As usual on these trips, I set a punishing driving schedule and didn’t have much downtime. Still had a good time though, and saw lots of great stuff. Drove south from Oregon to my first stop Yreka California. I had been to Yreka a few times growing up but had never appreciated the history of this old mining town. There are many Victorian mining-era buildings and homes here. After Yreka I drove Highway 3 south into Scott Valley. This is a beautiful drive on the edge of the rugged Trinity Alps mountain range. Towns like Fort Jones and Etna are quiet and peaceful towns to visit. The Etna Brewery is always worth a stop. After Etna, I continued south on Highway 3 and camped on a dirt road near the highway summit. Continued south to Weaverville. Weaverville is an 1850’s era mining town deep in the mountains of Northern California. The town had a large Chinese population and still has a 133 year old Joss House (Chinese temple). I had the Dirty Dog (Diego) himself with me so I thought from Weaverville I would hit the coast and drove west on Highway 299 to Arcata. This windy and remote stretch of highway follows the Trinity River and is a great drive. Once I hit the coast, I went south to Ferndale. I was having a hard time finding a dog-friendly campground so I took Mattole Road to Petrolia and Mattole Beach. The Mattole Road is one of the steepest and windiest paved roads I have ever traveled. This is rugged terrain! The rugged terrain has stymied road development over the years and kept this area relatively little used right in the heart of busy California. The area is known as “The Lost Coast” – and for good reason. Mattole Beach Campground was not crowded and was one of the nicest places I have ever camped. The campground was eight dollars per night. Reluctantly left Mattole Beach and headed back north to Eureka. Eureka has more well-preserved Victorian-era buildings than any town I have been to. I headed east on Highway 36 and camped in Van Duzen County Park in a thick grove of Redwoods adjacent to the Van Duzen River. The campground was $15 per night and showers were available. Drove east again on Highway 36. This is a long, windy road with a couple of sections that are a single lane wide. Be sure you are fed and gassed up before doing this drive – there are no services for a very long stretch of road. Eventually passed through Chico & Oroville, then took 119 to Quincy. Camped at Lakes Basin Campground on Highway 24. Numerous hiking trails start right from this great campground. As I would end up finding at several locations on this trip – the campground host had left for the season and all payment information, envelopes etc had been removed – so camping was free. Hit the road and headed for Gold Country. My first stops were Sierra City and Downieville. Downieville is one of the nicest mining towns I have visited and is very well preserved. Next I headed down river to Nevada City. Nevada City is one of the largest mining towns I have been to, and is also well preserved. Camped on Highway 20 at Scotts Flat Reservoir. Photographed downtown Grass Valley, then drove to Coloma. Coloma is where the California Gold Rush started and is historically very significant. Most of the town is a state park now. Continued on to Placerville. My favorite stop in Placerville was the Cozmic Depot Cafe, which is an old soda works building that uses an old mine shaft in the back for cold storage. 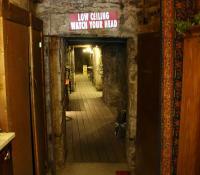 They had tables setup in the shaft and you could actually eat your lunch underground! Camped east of Placerville at Sly Park – nice but a whopping $25 per night! More mining town photography. The pleasant surprise of the day was the town of Sutter Creek. Camped at Fraser Flat Campground on Highway 108 – nice spot and 15 bucks a night. And the last few days……. I think I was starting to get road-weary at this point because I quit writing in my notebook. Continued down Highway 49 as far south as Mariposa then headed back to Oregon. Mokelumne Hill and Coulterville were my favorite towns during this part of the trip. Overall a good trip with perfect weather and uncrowded campgrounds. October is a great time to travel in Northern California! You didnt stop and visit Malakoff Diggings? Did you happen to take the Kentucky Mine tour in Sierra City? If not you missed a great one. The mine has one of the few or maybe the only working stamp mill in California. They turn it briefly on the tour to allow a couple of stamps to fall. We're not that into mining but have really enjoyed the tour. I was more interested in the building structure, great piece of post and beam wood construction.